Time Frame 15 min Markets any. 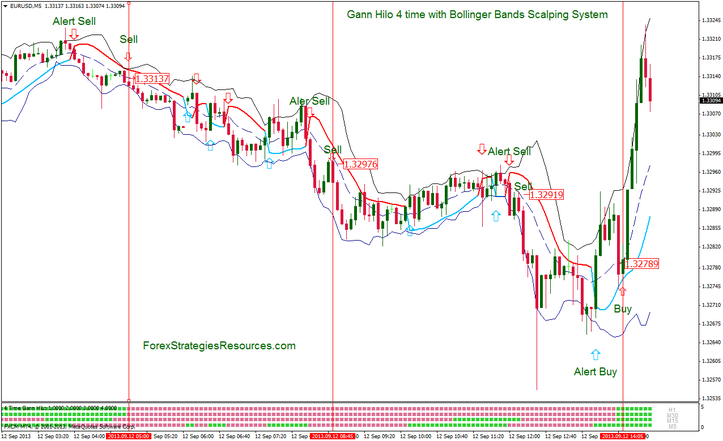 This Scalping System is Trend Following and Multitime frame It is based on Gann Indicator and Bollinger bands. Bollinger Bands Indicator (10, 2). For open a long position to wait that the price bounce into the middle band. For open a Short position to wait that the price bounce into the middle band. When Adaptive Gann High-low Activator change color. Profit Target 8-12 pips depends by currency pair. Gann Hilo 4 time with Bollinger Bands Scalping System. Adaptive Gann High-Low Activator indicator trading. Template and Indicator.